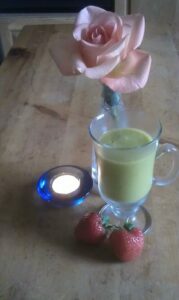 Rose Press is: a) A Christian b) A Usui Holy Fire11 & Karuna Reiki Master with 5 attunements including 2 at Stonehenge. 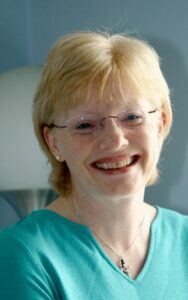 c) The holder of a Reflexology Practitioner Diploma with the Association of Reflexologists. d) A CIBTAC Body Massage and Anatomy and Physiology Diploma graduate. e) The holder of a IIHHT Practitioner Diploma in Holistic Therapy, Involving Aromatherapy, Reflexology, First Aid, Nutrition and the legalities of running a business. 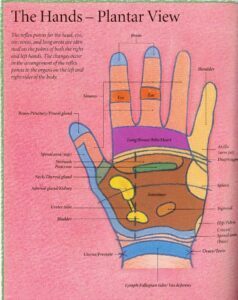 f) Rosie has also has been trained in a type of massage using practitioner body weight rather than the hands, in order to avoid injury to the practitioner. I asked Rosie Press who is a school teacher, a Christian, a Reiki Master, a Reflexologist and a Holistic Therapist about learning and healing matters. Rosie has had a lifelong commitment to an unusual combination of physical and spiritual disciplines. Leslie: You run ‘Folkestone Healing’ and other activities at Spire Lodge. Can you describe the full range of what you do and the creative intention/thinking behind it, please? Rosie: Spire Lodge is a quirky bungalow with a conical roof, and we hope its rather fairytale-like appearance will attract people to come inside and find healing and well-being. My husband and I aim to share our own experiences, interests and expertise to explore how body mind and spirit go together to bring healing and health. We put on morning workshops on a meditative/creative/mindfulness theme, I provide complementary therapy (Reflexology, Massage and Reiki) Steve provides a listening ear, leads a Tea and Tai Chi session on a Monday morning, and a casual Christian-based prayer/meditation group monthly. 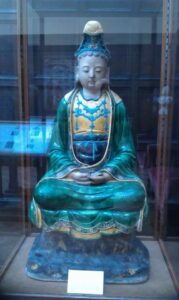 Our overriding intention is to help people slow down and become more reflective; and to provide a space where those who feel they are ‘spiritual but not religious’ will find an open place to explore spiritual & religious questions and practices, especially as they relate to health and well-being. For example we tried an Ikebana workshop recently. That became a fun time as people messed around with flowers and foliage, but also a meaningful time as they had some stillness to reflect on the message of the flowers symbolising ‘Earth’, ‘Heaven’ and ‘Humanity’. We always add some interesting wholesome things to eat as well. So we made Japanese sweets made out of soya bean paste to add to the theme, as well as attempting our own version of the Japanese Tea Ceremony with its mindful actions. Added to that we try to be open to people around us and listen or respond to their needs; that’s sometimes through conversations when we’re gardening (we have a garden open on three sides where walkers often want to watch the garden grow through the seasons and chat if someone is there) sometimes through being welcoming for people to drop in for a chat & cuppa almost anytime, or noticing when neighbours are in need. Leslie: How do you apply the skills you’ve gained from your experience of classroom teaching as well as your spiritual training? Rosie: They are largely practical skills so I apply them every time I give a treatment. Actually I often find myself thinking of my teachers when I give a treatment and feel so grateful for the expertise they have passed on. 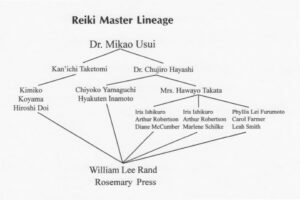 I apply teaching experience when I teach Reiki; which turns out to be quite a different experience from teaching in the classroom. I have the plan of what I want to do and a schedule of how long to take on each item. However I find the teaching seems to get done by an ‘outside’ force (i.e. the Reiki energy?) which seems to re- sort the order of events in line with the student’s interests, it also seems to guide my words – I don’t stumble around searching for the right expression so much, and it seems to sort the timing so that for instance a suitable break seems to emerge for lunch at just the right time, and the ending of the day comes without any stress of having to hurry things along to fit them in. Having said that the teaching experience of guiding people to work in pairs, and in finding pictorial ways to illustrate something has become very useful in teaching Reiki. We also use our teaching skills when leading the morning workshops. The sorts of things like planning the timing, a variety of tasks to suit visual, auditory and kinaesthetic learners , using a quiz or survey as a starter to set the ideas into play, responding positively to each contribution, setting the room suitably and so forth. Sometimes you do these sorts of things automatically and then realise they are teaching skills that have got ingrained… In teaching I was also part of pioneering ways to teach meditation in schools and I still use some of those scripts with the adult attenders of our workshops today. Leslie: What’s the story of your spiritual journey from childhood to today? What are the main experiences that have shaped your spiritual perception? Leslie: Who are the key spiritual exemplars for you? Why them? Rosie: Brother Roger of Taize because of his desire to keep living and faith simple; his ecumenism; his desire to set his brothers in the poorest areas of the world; and because his ‘pilgrimage of trust’ to set up Taize as a community is very like my own pilgrimage in coming to Spire Lodge. Florence Nightingale because as far as I understand from her (accurate?) biography, she was a feminist, someone who challenged the norms, a theologian, a mathematician and a healer. Similarly I am drawn to Hildegard of Bingen because she too combined healing & theology with a real variety of other skills. Steve, my husband, because his enquiring mind has led us both into all sorts of areas my own timidity would have prevented. And he has always totally encouraged me even if my path wasn’t his. A friend called Debbie who despite being plagued with self-doubt still feeds the homeless of Folkestone three nights every week and has done for years. Leslie: A spiritual journey also involves moment of difficulty and crisis. What have been yours, how did they develop and how did you ‘come through’ (perhaps partially)? Rosie: Being criticised by fellow Christians who want to say that what I am doing is satanic. It’s hard when people you think are on your side, turn against you. This happened when I was teaching and leading a meditation/stillness course for Year 10, when I led a Leavers Service at school, when Steve and I stood out on the side of LGBT people being accepted for ordination training, when I talked about enjoying yoga. Actually I don’t think I have come through. These attacks leave wounds. However I’ve stuck to what I feel deep down is right, I think and pray through the theological side of the attacks to consider if I’m wrong, and then do daily Reiki on myself. This seems to ground me in what is loving and true and gives me a greater sense of self-assurance. Leslie: What guides and sustains you today, in small, every day ‘feeling’ ways as well as in the bigger picture? 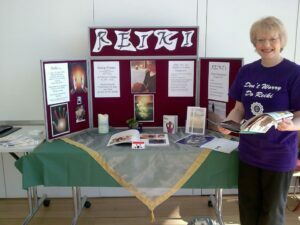 Rosie: Reiki and Prayer & Silence daily. Without this I go a bit distracted and disorientated. Some sort of spiritual reading, also each day if I can manage it. Retreats/ Day courses on spiritual themes, including church services. Singing; I’ve joined a church choir. Friends and lots of hugs. Steve, who I call my guru. Next week’s post is the inside story of the making of the film Heaven’s Rage. Based on my memoir of the same name, the film explores ‘Burning questions, hidden feelings and pressures to conform’. Thanks again Leslie for another interesting and inspiring post, and to Rosie for sharing her life journey stories.